Ria, an Imperial warrior, is the newest member of the Companions before you join, and highly determined to fight and die honorably alongside them. 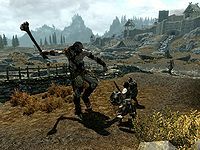 Ria may be found with a few other Companions fighting a giant at Pelagia Farm when you first visit Whiterun Hold. After this initial encounter, she will normally be found in and around Jorrvaskr. 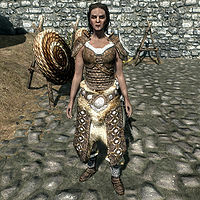 After the Companions quest line is complete, she can become a follower and be recruited into the Blades. She also becomes a potential candidate for marriage. When you ask her why she joined the Companions, she'll reply, "Are you kidding? I've wanted to be with them since I was a little girl. Haven't you heard the stories of Kodlak and Skjor fighting off the hundred-and-one Orc berserkers? Skjor says it was more like forty, but he's just being modest. Where else would I want to be but here? Learning with them, fighting at their sides." If you ask who the Companions are, she'll tell you, "Only the most famous warrior band in all of Skyrim. Have you been living with the horkers? When we arrive, blood is spilled and our blades sing to the glories of Ysgramor. This is life, brother/sister. The struggle is what reminds us to draw breath." Asking who's in charge around Jorrvaskr will have her respond, "The Circle are the ones who parcel out the jobs. That's Aela, Skjor, and the brothers, Farkas and Vilkas. Kodlak advises them, but he doesn't really give orders." You can also ask her what it means to be a Companion, to which she'll reply, "So much. This group... this family... this band... this is the best thing I've ever been a part of. The oldest fighting group in Skyrim, and nothing but glory from Ysgramor's day to our own. To be counted in that line is a bit of immortality. Even if I never see Sovngarde, I'll have that much." Before Take Up Arms or after Glory of the Dead, she can occasionally be encountered roaming Skyrim with Vilkas, killing wild animals. Although her default equipment is governed by the Light Armor skill, Ria is actually more proficient in heavy armor. This page was last modified on 11 December 2015, at 08:26.